Denny Jump (Bellevue, WA, United States) on 3 February 2012 in Art & Design. And this capture is a work of art. Great composition and wonderful colors. The people in the museum complete picture. @Doug: Hi DOug - Thank you so much - I agree....the inclusion of people in a setting like this really lends a nice feeling - cheers, sir! Great light and atmosphere for a little contemplative visit. @Gérard Beullac: Hi Gerard! Thank you very much sir! Beautiful reflections, Denny - and the art pieces really draw us in. The figures moving around the gallery help set the mood as well. Really fine colour & depth. It has a light floating feeling held down nicely by the weight of the dark bodies. Bravo! @Williams: Thank you very much, Paul ;-) Much appreciated my friend- have a great weekend sir! a colorful compo! well seen! Beautiful warm and inviting lighting, great colors and beautiful art displayed, fantastic capture. Have a great weekend. those semi-silhouette images are gorgeous! Beautiful pieces indeed, and I like this overview of the people visiting the gallery. Beautiful Pieces of art. great work and nice image. 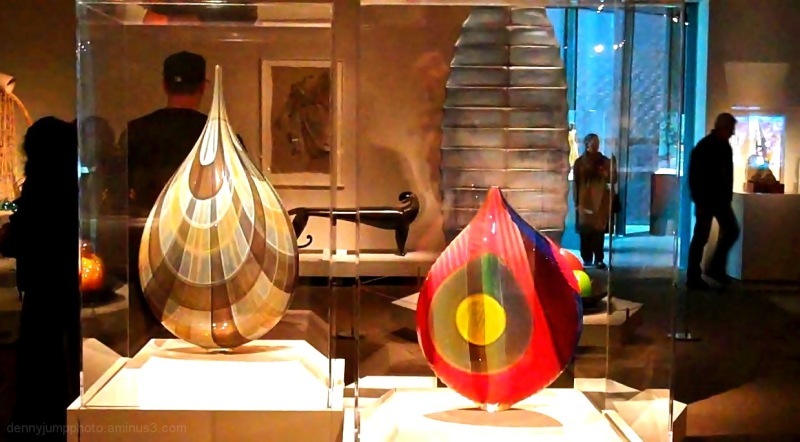 cool capture, denny, at and beyond these colorful and shapely objects! i like how you included the visitors in this pic! @franz: Have fun but becareful on those slopes! Thank you Franz...All the BEst and good skiing!! Beautiful pieces of art, whose colors are highlighted nicely here! Great depth that you've given this composition as well. Nice shot to reflect the museum, and the many things one can see there. I like it. Beautiful light on these colorful pieces of art. Great image! Have a great weekend! @Elaine Hancock: Thanks Elaine - you too..I love that old Chev!! The art and figures, the fore and the aft, carry an extra conviction in this . . makes for a 'being there' feeling. Nice one, Denny. Denny its great to see you made it to California! I like this shot and a great location! It has been very busy this year and everyone is doing well. I hope you stay warm! It has been a very mild winter for us with very little rain. Interesting shot at an interesting and fun place. It took some skill to make these!